The cake decorating world has enthusiastically embraced dramatic texture on decorated cakes. This informative video introduces the “Diamonds in the Rough Simpress™” and shows how this simple cake panel maker can produce exquisitely textured cakes that your customers, friends and family will love. Inspired by the look of natural diamonds, the faceted texture produced can be used to make decorated cakes that range in style from sophisticated to modern, to natural/earthy and is unsurpassed for geode cakes. Watch the video and be sure to catch the ending when silver color is applied to this texture on a cake. 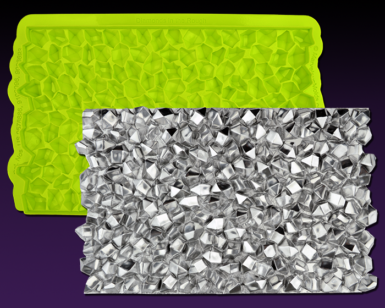 You’ll be amazed what this rough diamond, rock candy-like texture looks like in metallics.